If you happen to be my sister, and happen to be older than me, and your name happens to start with an ‘S’, don’t read any further. You’ll see this in person soon enough. 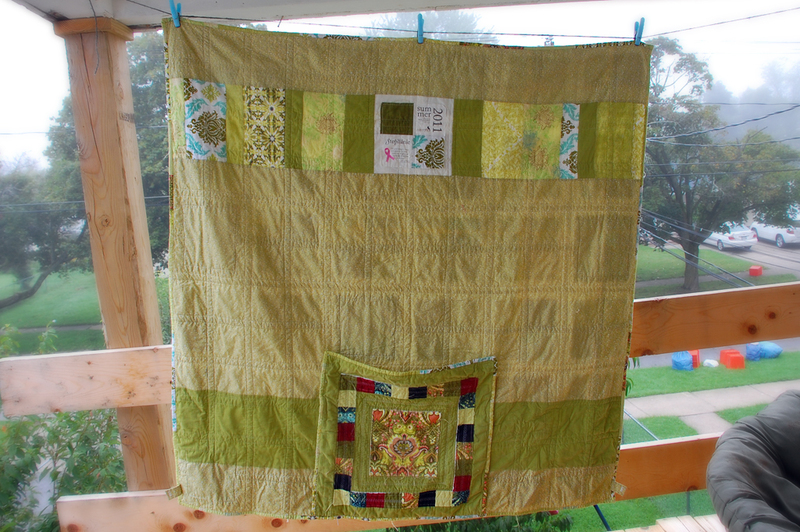 The sun was peeking out just enough for photos this morning, so I finally shot the Synchronized Squares quilt! Above-mentioned sister is perhaps a little obsessed with frogs, so Prince Charming by Tula Pink and a selection of green prints from various lines—as well as a few solids in green and complimentary colors (including a corduroy! )—made a great choice for this. 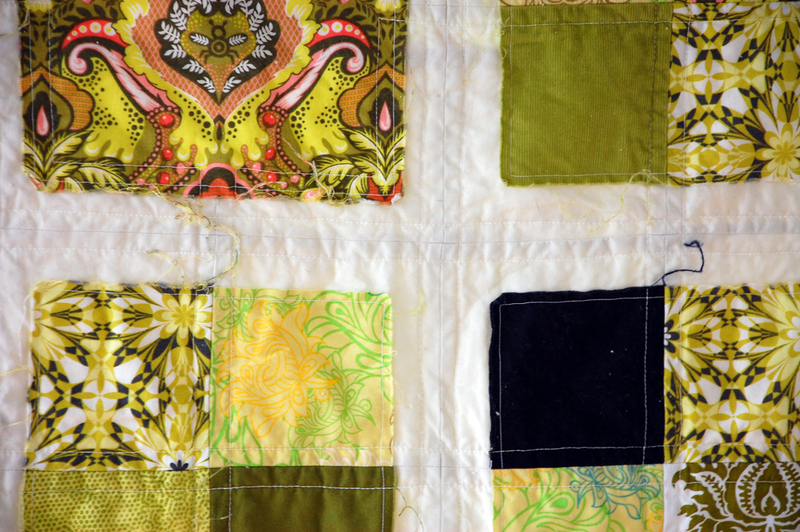 In case you haven’t been following along, this is part of a quilt along that ended a couple of months ago called the Synchronized Squares QAL, hosted by Rachel of p.s. i quilt. There are many lovely quilts, so do check out the Flickr stream! 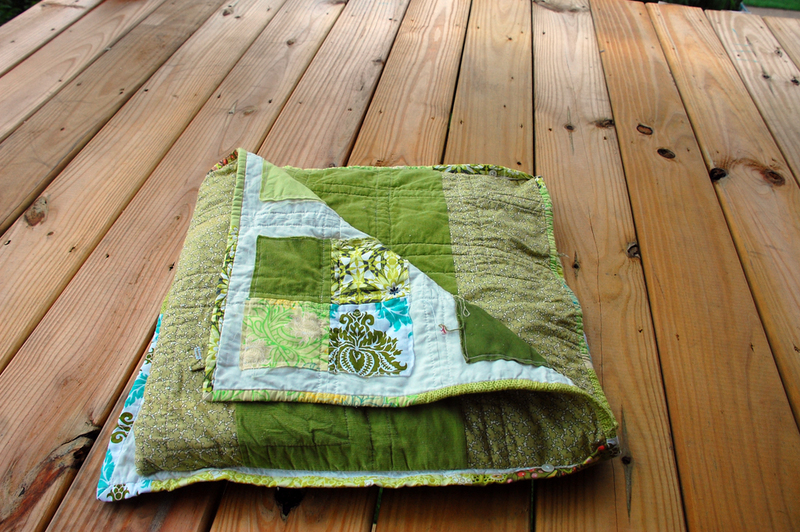 One new approach to me was that the squares are actually raw-edged, sort of like a rag quilt. I like it. It’s interesting. I probably need to run it through another laundry cycle before shipping it off, just to get the raw edges set a little more and some of the stray threads off. The QAL called for using layer cakes, but I chose to buy many different fabrics. This allowed me to fussy cut the Prince Charming blocks to feature the Frog Prince. 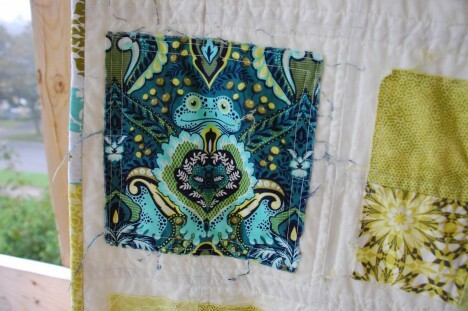 The construction of those seven blocks is similar to the others, only I sewed the white foundations together, then topstitched the frog on, so the white still had the proper seams in it, but the frog was seam-free. 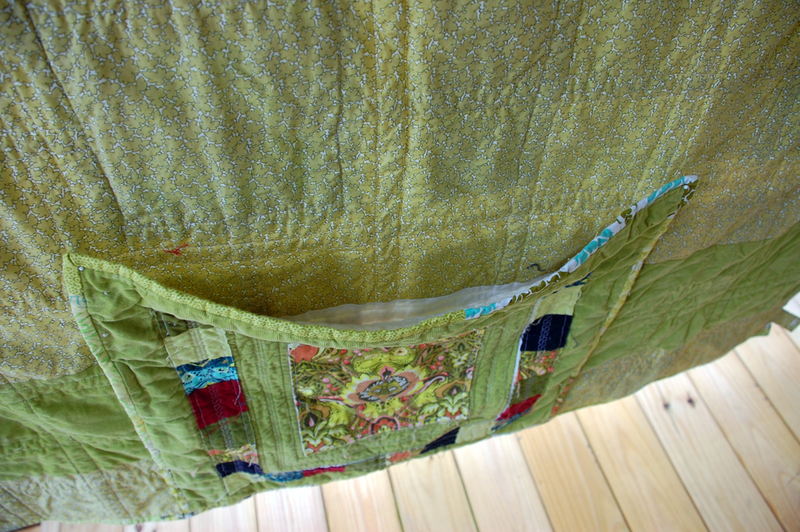 I quilted it all with white 28wt Aurifil thread (and 50wt Gütterman in the bobbin) by echoing the seams approximately 3⁄8″ on either side (width from needle to edge of walking foot), but going around the frog instead of criss-crossing the block. The Aurifil was great to work with. I used a 90/14 needle and didn’t run into any issues with skipped stitches. I did have a couple tension issues, but that was the machine, not the thread. I have those all the time, regardless of what I use. I only wish I’d had the 28wt when I was topstitching the colored blocks to the white background to match the quilting thread. I used Pellon’s Nature’s Touch White batting this go around. I’d never used it before, but I’m a fan. It’s cheaper than Warm & Natural (or White) and has the perfect loft and weight. There’s a custom label, of course. My sister’s been having a hard few years. Things are looking up, but hopefully this can provide a little comfort if needed. 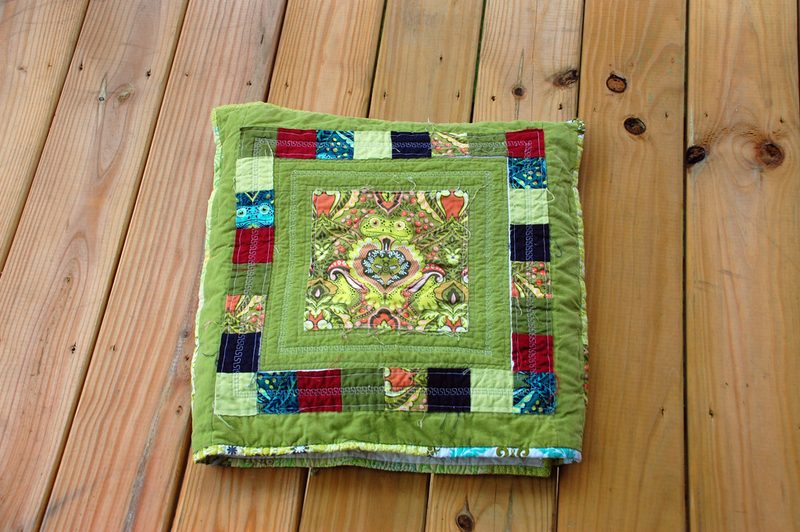 If you caught my post about being featured over at Craizee Corners’ Designer of the Month series, you saw that I added a pouch to the back so that the quilt can fold into a pillow. Once I had it fully constructed, I realized that one side of it will flop around. That wasn’t very desirable. An easy fix was to add two flaps with buttonholes (one on each side near the bottom), and two buttons to the underside of the pouch. 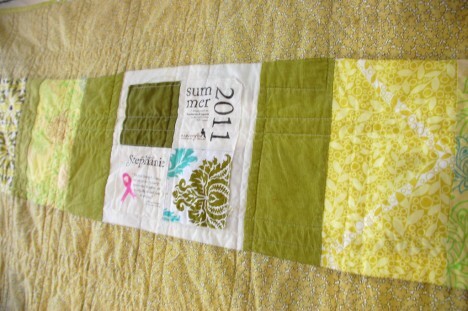 Only one is used at a time, but I put it on both sides so that the quilt doesn’t need to be folded the same way every time. The buttons are hidden when the quilt is open, and the small flaps don’t get in the way. 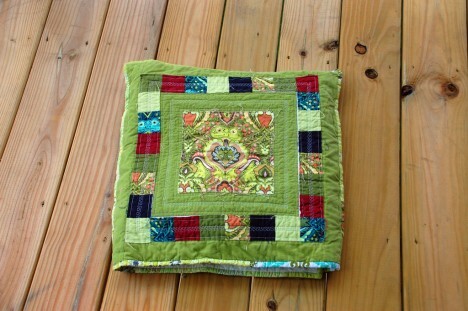 It’s a reasonably thick pillow, and the main green fabric is corduroy, so it’s nice and soft. 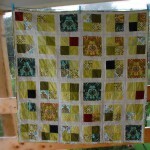 I used a raw edge on the pocket piecing as well. So that’s it. 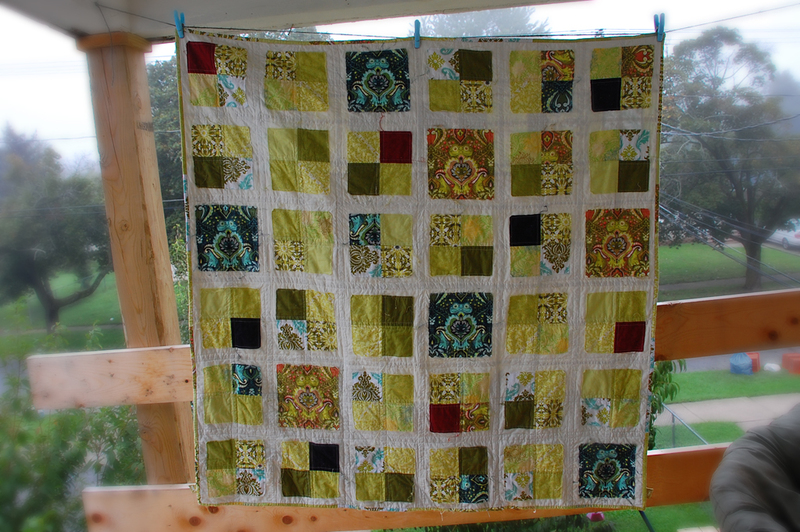 Another quilt finished for the year. I was going to save this for Christmas, but I usually only give presents to my nieces and nephews, not their parents, so I’ll be shipping this to her soon as a “just because” gift. 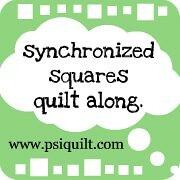 Did you do the Synchronized Squares QAL? 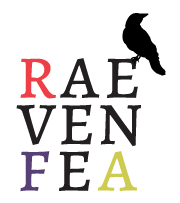 Post a link in the comments—I’d love to see!